Warning: this item is a repackaged item or an item with minor packaging damage or signs of wear. The article has been checked for full functionality. We offer a 1-year warranty. The oneConcept Uddevalla weather station is your own personal weatherman. Extensive information on the current, upcoming and past weather will make your life a bit easier. 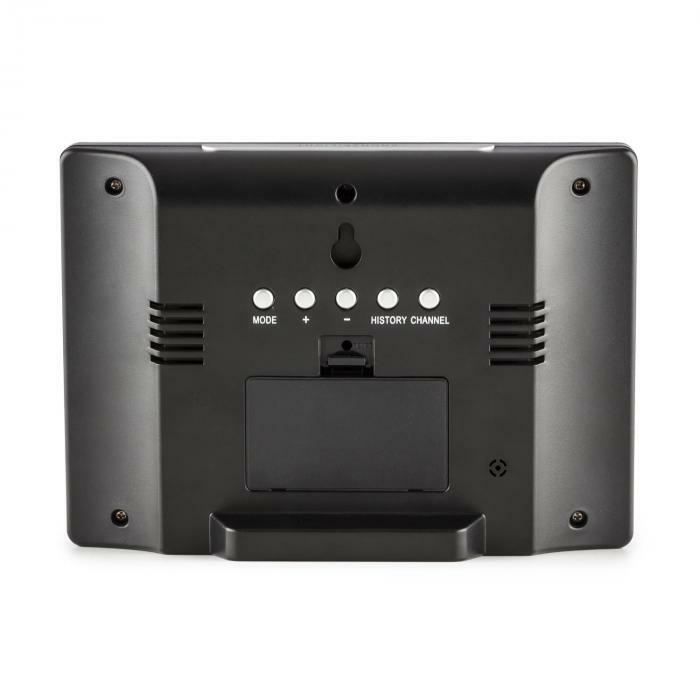 The system consists of two components: the compact base station from wich the measure data can bea easily read and the handy wireless outdoor sensor. You are supplied with extensive infomration such as temperature, humidity, air pressure, moonrise and moonset. 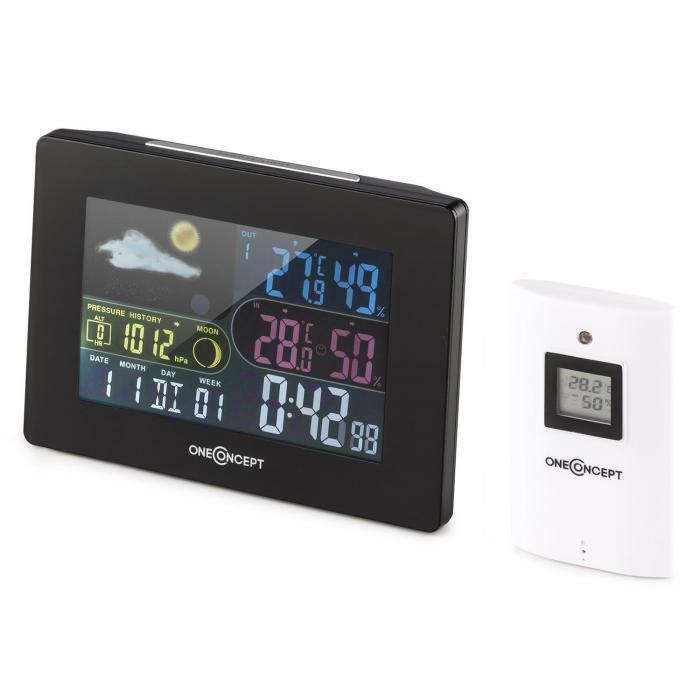 To display the weather, there is 14.5 color LCD display with backlight support. Self-explanatory weather symbols and a clear display contribute to its easy readability. Its internal memory stores the collected weather data automatically, enabliy subsequent analysis of the air pressure, temperature, etc. Particularly useful is the built-in alarm function which prepares you for the occurence of major weather events. You will always be prepared when it comes to staying dry. 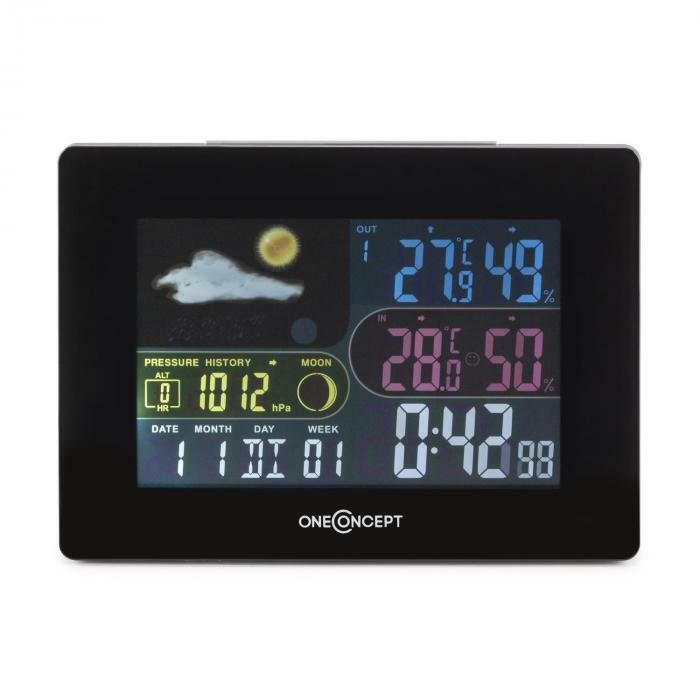 The oneConcept Uddevalla station is more than jus a weather display tool. THe compact base is decorated with a black glossy finish, making it an elegant eye-catcher in your living room or bedroom. There is the option of having it standing or wall-mounted (via the rear mounting point). 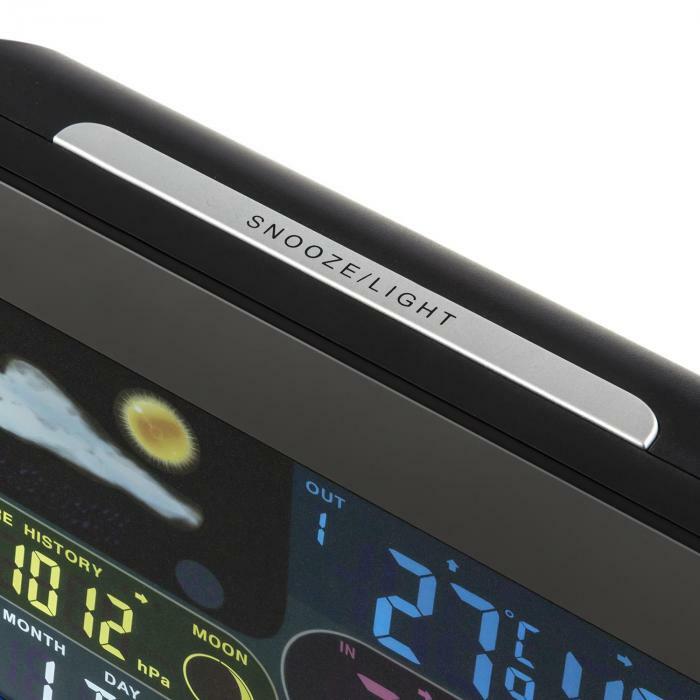 A programmable alarm and snooze makes it ideal for installation in sleeping areas. Power is achieved via the power adapter or two optional AA bateries for the base station, while the measuring station must be equipped wtih three AAA batteries. Thanks to a range of up to 100 meters, you have freedom in their positioning. 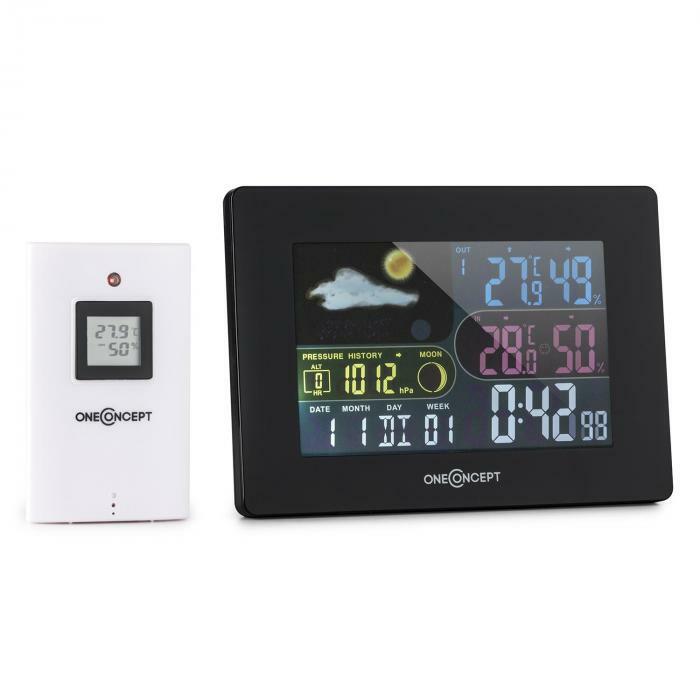 With the oneComcept Uddevalla wireless weather station, you know exactly if rain is expected, how cold or warm it is outside and how strong the wind is. Please note that the outdooe sensor is protected against rain water but should be position in a weather-protected location such as under a canopy or somewhere similar.